Lamb loin fillet is a very lean, tender cut that requires virtually no preparation and cooks very quickly. 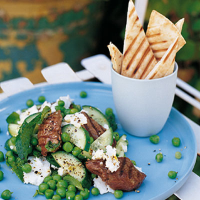 It's delicious served with this mint, pea, feta and cucumber salad. Preheat a griddle over a high heat, or prepare the barbecue. Cut each fillet into 6 thick slices and season well with freshly ground black pepper. Sear the lamb for 2-3 minutes on each side or until well browned and cooked to your liking. Remove from the heat and leave to rest for 5 minutes while you prepare the salad. Top and tail the cucumber, halve lengthways, then cut into thick diagonal slices. Add the mint leaves and peas. Crumble over the feta, drizzle with olive oil and season with black pepper. Toss the salad together well and serve topped with the lamb. Eat immediately with warmed, griddled pitta bread, and lemon wedges for squeezing (optional).